Matilda and Louis Hines get set for superhero fun. Half-term at Worcestershire County Museum at Hartlebury Castle promises to be great family fun with four days of superhero themed activities. 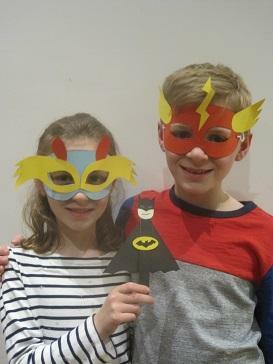 Between Tuesday, February 19 and Friday, February 22, 11am-4pm, young visitors will be able to don their superhero capes and use their superhero senses to make their own superhero mask and create a pop stick hero. Caped crusaders will also be able to follow the Superhero trail around the Castle and discover over 1000 years of history on their journey including toys from the past, historic room sets and beautiful Gypsy caravans. Families can explore the new developments at Hartlebury Castle including marveling at talking portraits, promenading the Long Gallery and following in the footsteps of royalty as they stroll around the moat enjoying the gorgeous spring flowers. Pippa Ashmore, Events Officer at Hartlebury Castle, said: "We hope our younger visitors will come dressed in their superhero costumes and be set for plenty of superhero half-term fun. Not only can kids get creative, there are also grounds to explore which are looking particularly fine as the spring flowers start to appear. Combined with the new Café and children’s play area there really is something for all the family to enjoy." Hartlebury Castle is situated off the A449, just south of Kidderminster, and reopened last year following significant Heritage Lottery-funded developments making it a larger visitor destination.